Anyone who knows me knows that I love my calories. My favorite kinds of meals are found at fancy restaurants, where I can order a prix fixe menu with multiple courses and wine or cocktail pairings carefully curated to each of the courses. That is my heaven. I thrive in that environment. Give me foie gras, fondue, charcuterie, and any other French word that sounds like a heart attack on a plate, and I’ll wash it down with a martini, Malbec, and Amaro. Luckily, I’ve learned to confine that type of diet almost exclusively to the weekends, and now I focus on being a 100% clean-eating vegan during the week. It helps me focus, get better sleep, and feel happier, which all helps with the 9-to-5 universe. Going all out on the weekends definitely keeps the week in perspective and gives me a great outlet on Friday evening. So what happens when the weekend splurging ends? What happens when bottomless mimosa brunches get replaced with a strict 21-day regimen of carefully calculated meals? What happens when this city dweller, who thrives on trying new restaurants and cocktails, gasp! goes on a diet? Specifically, I’m talking about the 21-Day Fix Extreme. Now, I’m no stranger to diet and exercise programs. Last year, I did the 21-day inner body tune up known as the Beachbody Ultimate Reset. It helped me bust through a weight-loss plateau and really helped transform my perspective on what I put in my body. During the Reset, you are mostly eating vegan and you’re encouraged NOT to exercise, since your body needs to focus on detoxing rather than repairing muscle. That program was wonderful, but I wanted to try something different this year. The 21-Day Fix Extreme caught my eye. Why? After doing the super-intense Reset, I figured I could do this Fix for 21 days (I can really do anything for 21 days! ), it was super cold outside (so bar/restaurant-hopping is less appealing), and I really wanted to see what would happen to me if I really dialed in my nutrition AND exercised according to the program for 21 days. So, what is the 21-Day Fix Extreme? The 21-Day Fix Extreme is a diet and exercise program. Exercise: You get seven “extreme” 30-minute workouts, one for each day of the week— so your mind never gets bored, and your body never adapts. The workouts feature a unique blend of steady-state aerobics, resistance training, and explosive power moves that target every muscle in the body—to help you get shredded fast. Diet: For your nutrition, you practice portion control and eat ONLY clean foods (unlike the original 21-Day Fix, which allows its participants the occasional chocolate or glass of wine). No treats. No cheats. No excuses. The program comes with a set of color-coded containers. Each container corresponds to a different type of food group. For example, red is for protein, and green is for vegetables. You do a simple equation to figure out how many of each container you can eat in one day. You spread out the containers throughout the course of the day as you like. Here is a short video on the 21-Day Fix Extreme. 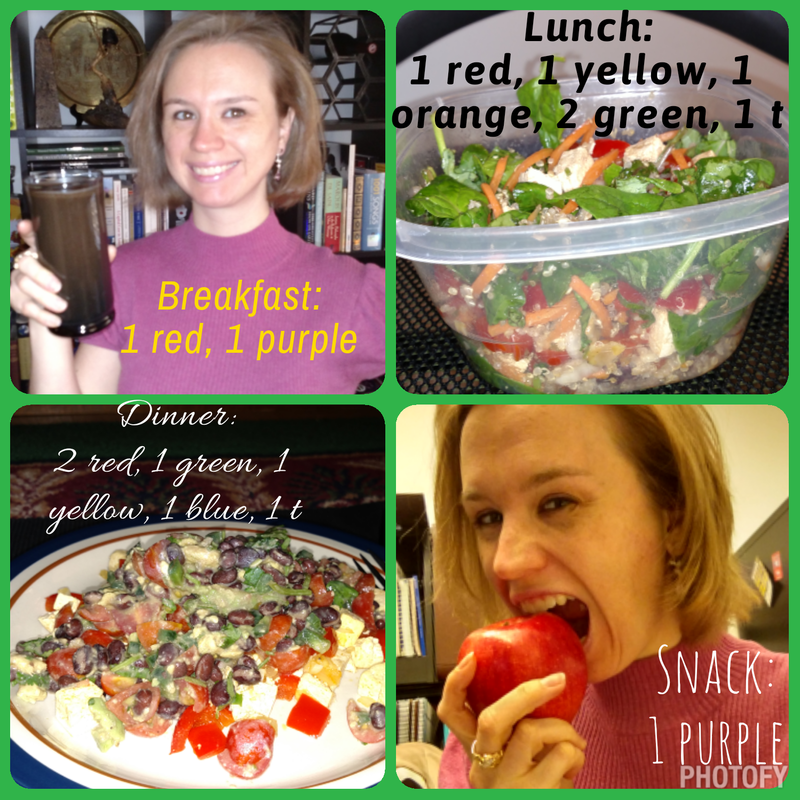 What did you eat on the 21-Day Fix Extreme? In order to make the program even HARDER, you’ll never guess what I did. That’s right – I made it vegan. On the 21-Day Fix Extreme, the only vegan protein options are tofu and tempeh (and some powders). Luckily for me, I like both. Breakfast: For breakfast every day, I had chocolate vegan Shakeology (1 red). This is something that I have for breakfast every day anyway; however, I had to make it with water rather than almond/coconut milk, which is what I usually use. I got one fruit serving in during breakfast by adding 1/2 banana to the Shakeology. Since vegan protein options are restricted for the 21-Day Fix Extreme, I used two different types of plant-based protein powders to help me get my 4 red containers. For the second week of the program, I added some pea protein to my morning shake, and in the third week I used hemp protein. The Shakeology did a great job keeping me full until lunch time, especially with the added protein. Snack: I had an apple (1 fruit) as a snack every day between lunch and dinner. Dinner: Though I had the same breakfast, lunch, and snack every day, dinner was something that I tried to mix up regularly. I’ll tell you about some of my favorite vegan dinner options. Though these are vegan, they can be easily made nonvegan by replacing the protein with an animal-based protein (e.g., chicken). I essentially made guacamole with the avocado, veggies, and black beans, cilantro, seasoning, and lime juice; cooked the tofu with garlic and oil; and then topped it with the guacamole. 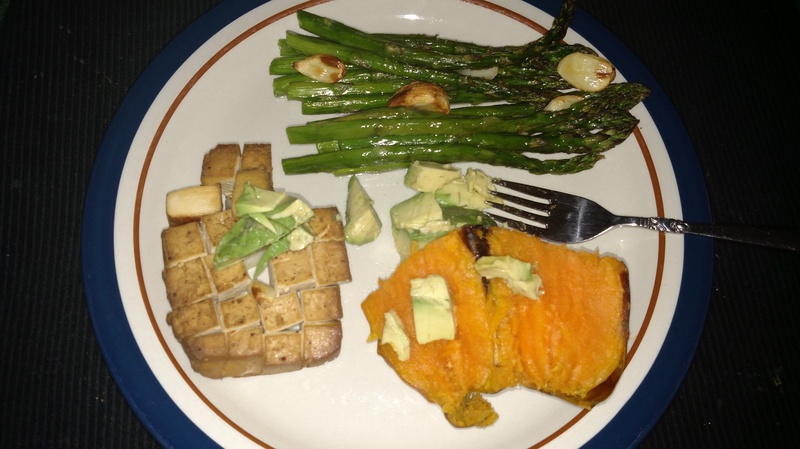 I baked the sweet potato; roasted the tofu with asparagus (tossed in olive oil with cloves of garlic); and added avocado before serving. The avocado reminded me of a butter substitute for the sweet potato. It was delicious! 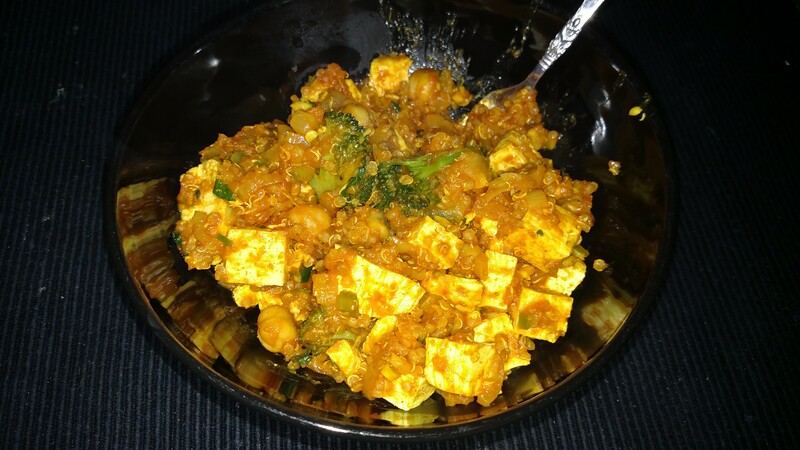 This was my absolute favorite invention from the 21-Day Fix Extreme, and I continue to eat this regularly for dinner even after the program ended! I heated the coconut oil, added the garlic, onion, and about 1 teaspoon of each freebie spice (except ginger, which I added near the end). Then I added the tofu and coated with the spices. If I were doing broccoli, I added that with the garbanzo beans. I added the tomato sauces and coconut milk, and let it cook. Near the end, I stirred in the quinoa and spinach. I used either broccoli or spinach depending on which I had on hand. What were the workouts like on the 21-Day Fix Extreme? Sunday: Yoga Fix Extreme – I am not a big fan of yoga, but I really liked this efficient yoga workout. It is probably about 1/2 vinyasa sun salutations and 1/2 balance postures. There were people modifying to make it both easier AND harder in the video. The one guy in the video is really amazing – doing headstands and arm balances, but Autumn does NOT do some of the super crazy poses, so rest assured. This is a yoga workout that can be done by almost anyone. Monday: Plyo Fix Extreme – Mostly jumping moves with weights. A great workout to get your heart-rate up. Tuesday: Upper Fix Extreme – A series of upper body moves, mostly done with dumb bells, but also with a resistance band. I am not normally a big of resistance bands in workouts, but I really enjoyed the moves that used the band, as I feel like it helped me target underutilized muscles. Wednesday: Pilates Fix Extreme – Like yoga, pilates isn’t really my thing, BUT I thought pilates using the resistance band was a lot of fun! I wasn’t really out of breath at all during this workout, but I did definitely started sweating near the end. Thursday: Lower Fix Extreme – A great lower body workout, also uses both weights and the resistance bands. Friday: Cardio Fix Extreme – Great cardio workout that utilizes weights. Saturday: Dirty 30 Fix Extreme – A total body workout that uses weights. I really loved this one. The workouts are extreme, but they’re not impossible. I love Shaun T and his Insanity workouts – those are my “soul mate” workouts – but the 21-Day Fix Extreme is NOTHING like Insanity, which is definitely extreme, intense, difficult, not for beginners, and sometimes complicated. The 21-Day Fix Extreme can be done by beginners, especially if you modify. The moves are NOT complicated. They are pretty basic, tried and true moves, sometimes tweaked to help burn more calories. You’ll see a lot of simple moves, like lunges, squats, and shoulder presses. Autumn is not trying to reinvent the wheel. She is kind of the opposite of Shaun T in that you might not be able to do Shaun’s plyo pushups the first couple of times you do his workout, but you work to get there. Autumn only has 21 days with you, so she is going to give you moves that you CAN do to be as efficient with your time as she can be. They’re simple and effective moves that you can make harder by adding heavier weights or putting more into it (i.e., jumping higher). 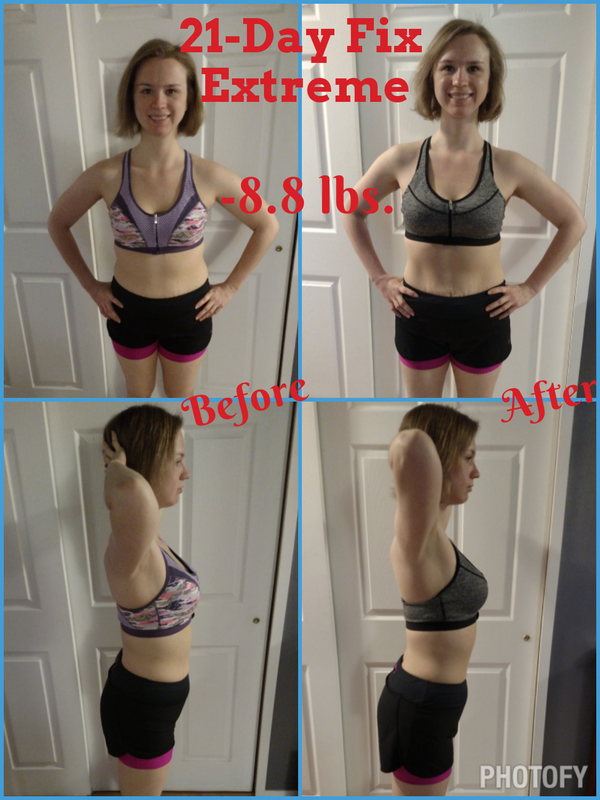 So, what kind of results did you get doing the 21-Day Fix Extreme? Okay. I HATE HATE HATE sharing my before-and-after pictures. BUT I took them so I could get my free 21-Day Fix Extreme t-shirt and enter the Beachbody Challenge and perhaps win some cash prizes! So, since I took my pics anyway, I might as well share them with my readers. As you can see, I lost almost 9 pounds total doing the 21-Day Fix Extreme. On a short 5’2″ girl like me, that’s quite a bit! And I can assure you that was not all water weight, as I have a fancy scale that measures water, and my water levels stayed pretty constant throughout the program (actually, they increased a little, see below). I am most proud of the definition that I got in my abs! (Right?! You can totally see that!) I was honestly VERY surprised that I got such great results, as I feel like I have done much harder workout programs and have seen LESS results. I think that the simplicity of the program allowed me to really focus on pushing harder, lifting heavier, and having proper form. Would you do the 21-Day Fix Extreme again? Yes, absolutely! It is hard for me to find 21 days to block off on my schedule because, as I mentioned, I like to do a lot and often have food/drink-related events on my weekend agenda, but i would definitely do this again if I can find the time. It would be great to do leading up to a vacation or special event. It really helped me break through a plateau and helped teach me better portion control. 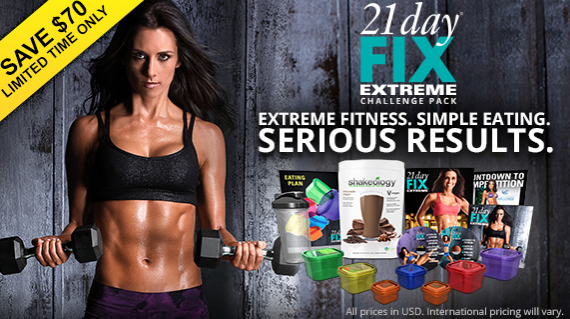 How do I order the 21-Day Fix Extreme? Go here to order the challenge pack, which comes with Shakeology (i.e., one of your meals throughout the 21 days, which is really a huge time and prep saver). Alternatively, you can order the base kit here, though the challenge pack is really the better deal. How can I know that I will succeed if I do the 21-Day Fix Extreme? As with any health and fitness program, you get out of it what you put in. No one is going to do the program for you. You can’t expect to see results if you don’t do the work. BUT I can offer you my free coaching services to help you get through the program just as I did! I can help you stay accountable to meet your health, fitness, and wellness goals. Please go here to sign up for a free Team Beachbody account. I will become connected with you as your coach, and I will contact you to learn more about your goals and talk to you about how to get started.